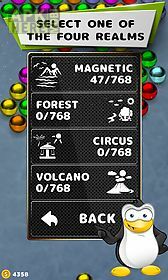 Magnetic balls bubble shoot game for android description: Review: magnetic balls puzzle game features: 4 worlds with different physics 384 levels with increasing difficulty 16 collection kittens with 80 items for the collection of which you gain experience new location vacation (at the end of stage) in which you can help to make the penguin ski resort endless game mode with adjustable difficulty (nightmare included) amusing ball physics for different materials leaderboards friendly user interface mode for people with impaired color vision (in settings top right button)game description: there are two game modes endless mode with adjustable difficulty ( arcade button) and campaign mode ( levels button). 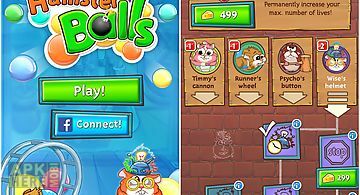 Game has four worlds with different physics and decorations which can be switched by the realms button in the main menu. The gravity in the playing area is upward directed and this is taken into account for geometrical calculations of wall rebounds and ball drops. In the game you can see the score time and number of coins on the left the players ball queue on the right and the current ball on the bottom side. 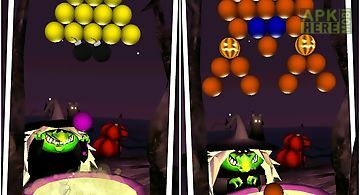 Special balls can be chosen by pressing on the current ball. Second pressing allows to change the ball type. Game instructions: press the screen where you want to shoot the ball. The new line appears in the glass after several balls shot (amount depending on the level). 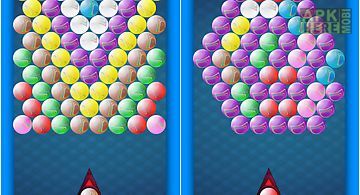 Combine three or more balls in one line to destroy them. You get coins for each line of four and more balls. You can exchange the coins for special balls to use in difficult situations (or just for fun). You can get combo bonus for destroying of several groups of balls within - 5 seconds. 3 combo will give you a special mine ball. If you combine it in line with 3 or more balls you will get an explosion and an extra coin. 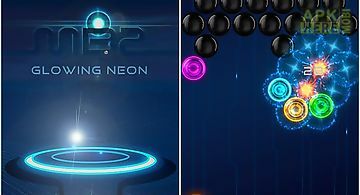 Magnetic balls 2: glowing neon b.. Shoot out colorful balls aiming at the bunch of them at the top of the screen. Explode groups of balls. Test your reaction speed attentiveness and logic in.. 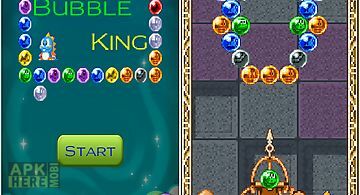 Bubble king is the most classic and addictive shooting bubble buster game. 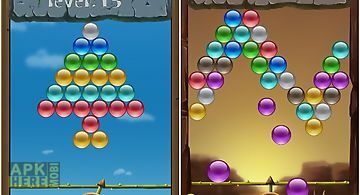 Tips: make combinations of 3 or more bubbles to make them burst. Clear all the b..
An addictive bubble shooter game! Ready? Aim shoot! Match 3 or more color balls to pop them! Help your cute hamster friends reach their home in this bubble.. The highly popular bubble shooter game is finally on the android market! 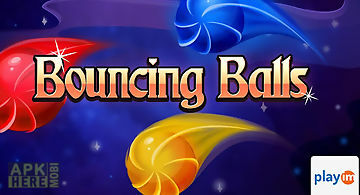 The original painfully addictive bouncing balls match 3 game in full mobile versio.. 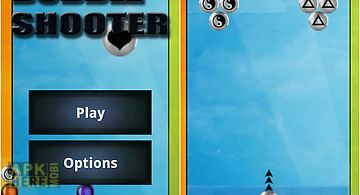 Shoot bubble is new bubble shoot games 2016 classic casual puzzle game really fun to play in all time. 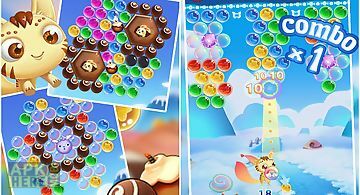 Do you love bubble shooting games? Then you will enj.. 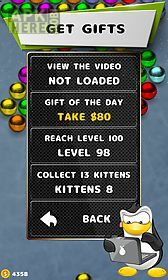 The most classic bubble shooting game with brand new item balls and deluxe graphics! There are 200+ challenging levels waiting for you to clear up! In clas.. 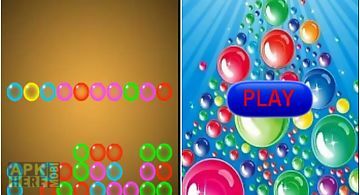 Bubble shoot hit is the best classic fun bubble shoot hit game. Its really simple and addictive. Clear all the bubbles to level up. How to play: - combinat.. Shooting bubbles to save jenney 39 s friends in candy paradise. 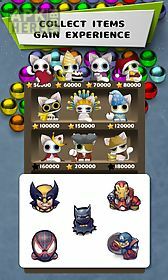 It 39 s the most fantastic bubble shooting match 3 game! Vivid graphics relaxing music and .. This game is full of fun. In this game you can shoot the bubble by two way either by hitting the bubble directly or first aim and then shoot. 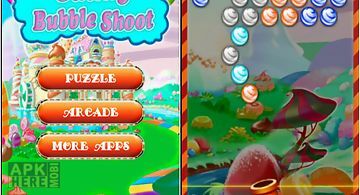 This game has..
Fun and addictive candy bubble shoot game! 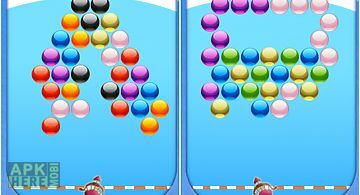 Another classic candy bubble match three game come to google play. Clear all the candy bubbles on the screen to .. 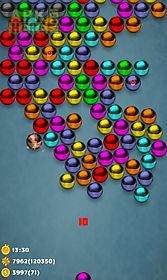 This is a fun and addictive bubble shooter game! Clear bubbles on the screen and trying to use at least the bubbles and the shortest possible time. Notes: .. Bubble shoot all day long! With bubble shoot halloween you will given the opportunity to play a classic bubble shooting game in a brand new 3d environment!..